Digital rotation is not as effective as manual rotation but will be tolerated more readily in women without regional anaesthesia. Place the tips of your index and middle fingers along a suture line, preferably where there is overlap of the bones e.g. 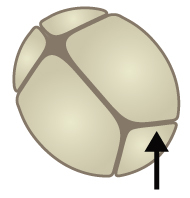 the parietal bone overlapping the occipital bone. Exert pressure upwards with the tips of your fingers to rotate the posterior fontanelle towards the symphysis pubis. This can be performed between contractions or whilst the patient is pushing.